Despite its hefty price, this smart wall outlet delivers. It's packed with unique features and compatible with all the major voice-control systems. While smart plugs have saturated the market, they have some drawbacks. They protrude from your wall and can sometime block the adjacent outlet. So if I know I want to use a specific receptacle in my home, I much prefer buying a smart wall outlet. They integrate into your existing gang box and provide the low profile many of us are looking for. But for smart home consumers, options have been limited. And when it comes to Apple HomeKit compatibility, iDevices sits alone. The iDevices Wall Outlet is an ambitious product from a company that has found some footing in the industry. It connects to your existing WiFi (2.4GHz only) and requires no additional hub. They’ve added some nice features like energy monitoring and a customizable night light too. But their real hook is being the only wall outlet on the market that works with Siri, Alexa, and Google Assistant. At first glance, the iDevices wall outlet looks like your standard decora style receptacle. It’s white plastic exterior has two buttons in the middle along with a small LED nightlight. The outlet does not sit flush with the faceplate and protrudes a fraction of an inch out. This allows for access to a pull-out tab with your Apple HomeKit barcode. Installation is straightforward for those who have replaced outlets before. There are numerous videos online to walk you through step by step. An electrical novice like myself was able to do it (albeit slowly). The outlet connects using wires instead of screw terminals. This might make for a tight fit in your gang box. There is no faceplate included which feels like a cheap move. You can pick up a rocker style plate at the hardware store for a buck though. Set up depends on what platform you’re working with. For Apple users, it’s a cinch. Once the receptacle has power, it should pop up inside your Apple Home app. You’ll scan the code and be ready to roll. Android users require a few extra steps. Mainly downloading the free iDevices Connected app and going through their connection process. This will take a few minutes but was painless. The iDevices Wall Outlet lets you control each receptacle independently. You can have one on and the other off. They can have completely different schedules. Controlling the outlet can be done through Apple Home or the iDevices Connected app. Note that if you want to use Apple Home when you’re away, you will need an Apple TV, HomePod, or new iPad acting as a hub. The app is fairly basic. The ability to take a photo of the device you’re controlling is a nice touch. Scheduling can be done by setting times and days but doesn’t allow you to set for your locations sunrise and sunset. The energy monitoring is well done and accurate. It’ll track watts used, how long the outlet is on, and even compute the estimated cost using your local energy rates. An LED nightlight allows for customizing color and brightness. This is treated as its own device and controlled independently from the outlets. It’s a nice addition that has become a staple of the iDevices brand. Just note that the light is not as big as the ones found on the iDevices Switch smart plug. Through 6 weeks of use, there’s only been a couple connection issues. Usually when the internet goes down and the plug doesn’t reset itself right. But otherwise, it worked as well as can be expected 30 feet from the router. If your internet does go down, you can manually turn the switch on and off with the button on the front. Controlling with voice through Siri works like a dream as soon as you’re connected. Amazon Alexa and Google Home Assistant worked well too. I wasn’t as thrilled with set up process on them (they require multiple steps). But after around 5-10 minutes, they synced up. You’ll want to change your outlet names to the devices they control. That allows you to say “Alexa, turn on the coffee maker” instead of “Outlet A”. It should be noted that the nightlight can only be voice controlled through Siri at this time. There’s a lot of other unique ways to use the outlet. I’ve paired mine with my iDevices Wall Switch. Meaning that if I turn on the wall switch, it will turn on the receptacle in the wall. This is a cheap way of creating a switch-controlled outlet without the hefty cost of an electrician. 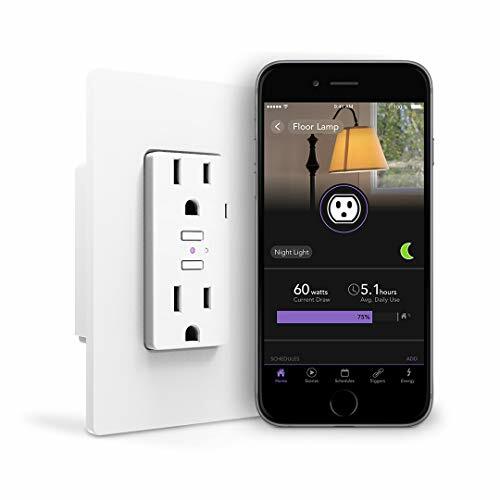 I think parents will love using this in their kids bedroom to turn off outlets at night that are connected to televisions or video game consoles. There’s a lot to like with the iDevices Wall Outlet. It performs well and has some nice features. And of course there’s the Apple HomeKit, Amazon Alexa, and Google Home support. But it is expensive. And you have to ask yourself if it’s worth a few bucks more to have the more aesthetically pleasing outlet over a pair of traditional smart plugs. For Apple HomeKit users, this is the only game in town. And if the price isn’t an issue, you’ll enjoy this. For everyone else, this is great to replace a few outlets in the house. But if you’re looking to transform more than 5, I think you’d be better off embracing the Z-Wave protocol. Something like the Leviton DZR15-1RZ would be half the price per device and not require 20 separate connections to your router.